A yacht engineer role is a chance to work with some of the most high-tech, state-of-the-art systems in the world; superyachts are full of intriguing and complex technical and mechanical operations that you will love getting to grips with. Plus, whenever you poke your head out of the engine room door you are likely to be in a stunning new location. It sounds like every engineer’s dream, but what does it actually involve? The crucial part of any yacht engineer job description is maintaining the mechanical and electrical operations of the yacht. From day to day this can incorporate mammoth tasks, such as fixing a faulty engine, and smaller assignments, such as adjusting a speaker in the media room. Either way, it is an extremely important role onboard – certainly one in which you’ll never get bored! Find out what to expect from a typical yacht engineer salary, their responsibilities, how to get the job and the qualifications you will need below, or browse our available yacht engineer jobs on our free Cotton Crew Jobs app. What is a typical yacht engineer salary? Starting out as a 3rd or 4th engineer, you can expect to earn anywhere from $3,000 to $6,500 per month, and as you move up the ranks to 2nd engineer this increases from $5,000 to $8,000. In the top position, a chief yacht engineer salary can be anywhere between $8,500 to $13,500, depending on the size of the yacht. It’s worth noting that those on charter and rotation yachts typically earn around $2,000 less than those on private vessels, so if you want the big bucks then private yacht jobs are the way forward! Conversely, electrical engineers working on large yachts benefit the most from rotational work, typically earning between $5,000 and $8,500 per month. There is no average yacht engineer salary, with roles varying so much from yacht to yacht, however these figures are a guideline for what you can expect to earn. What is a typical yacht engineer job description? 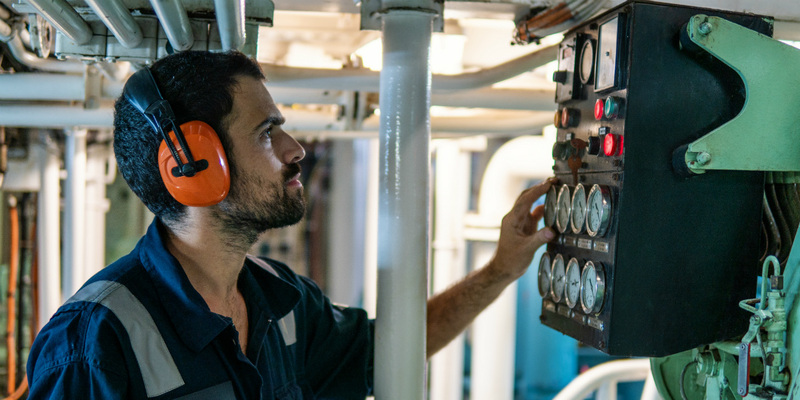 A yacht engineer’s job description certainly isn’t one-size-fits-all, with so many different types of engineering jobs on yachts. The chief engineer oversees all engineering operations on the yacht, reporting directly to the Captain about the technical condition of the engines, propulsion, ancillaries and interior systems. Working together with the Captain, the chief engineer is also in charge of maintaining the yacht in compliance with regulations. It is their responsibility to ensure the yacht passes all flag and port inspections. They also need to be able to effectively manage the team of yacht engineers below them, if such a team exists. On smaller yachts with fewer crew, the chief (and potentially sole) engineer may also need to help out deck as required, especially with docking, getting underway and anchoring. Only usually a feature on superyachts over 100 meters, the 1st engineer will relieve the chief engineer of commanding the engineering yacht crew, assigning tasks, organizing workload and supervising as needed. When there is a 1st engineer onboard, the chief engineer instead takes on an almost wholly administrative role, focusing on completing the large amounts of paperwork that come with such a supersized vessel. The 2nd engineer is the more typical second in command for the chief, sometimes playing the role of supervisor for the more junior crew below them. Primary duties include maintaining the engine room and handling some of the more difficult technical repair tasks onboard. The 2nd engineer should be able to stand in for the chief engineer as necessary. 3rd engineers are generally tasked with maintaining the interior systems, alongside tenders, toys and deck equipment. However, responsibilities vary greatly from yacht to yacht. The 4th yacht engineer is only employed on larger superyachts, and is often new to boat engineering with a lot to learn. A helpful pair of extra hands to assist with whatever needs doing onboard, the 4th engineer often splits their time between gaining sea experience and undertaking courses on land. Yacht engineer roles are ideal for someone who is very solutions-oriented, able to troubleshoot everything onboard while operating with the utmost flexibility. One moment you may be hunkering down in the engine room, another you may need to be up on deck chatting to the guest about a broken jetski, so you have to be ready for anything. Planning and organization are also important skills, as a large part of the yacht engineer job description is preventative maintenance – stopping a fault before it happens. So, how do you become a yacht engineer and start earning that enviable yacht engineer salary? Working your way up through the above positions is a good place to start. On yachts over 100 meters there may even be lower ranking roles that are an easier way to get your foot in the door, such as the wiper/oiler and motorman (or woman!). However, entering a yacht as a 4th engineer – or 3rd engineer on a small yacht – you will still be expected to be learning and gaining certifications as you go. You can also transition over from the commercial shipping industry after undertaking a cadet scheme and completing your Officer of the Watch in engineering. Taking a cadet scheme is a great way to quickly get your seatime on vessels over 3000GT, securing you an ‘unlimited’ license which puts the world of superyachts at your feet. Yacht engineer jobs aren’t for everyone, but if you like the sound of a varied role where you are responsible for the upkeep of a multitude of systems, getting to travel to incredible destinations all over the globe and being rewarded with a generous yacht engineer salary, then why not start training today? What qualifications do you need to become a yacht engineer? Like the sound of the yacht engineer job description and think you have what it takes? Find the qualifications you will need below. Depending on the size of yacht you want to work on, you may need the following licenses.